say hello to these unfortunate wedges from payless. hehee i saw them a month ago on a "what were they thinking" post and couldn't help but laugh. yesterday i was bored and somehow wandered upon these uglies again on payless and suddenly thought, maybe i can do them over. like stud them. on the sides. (like from that diy post about a week ago).... or something. 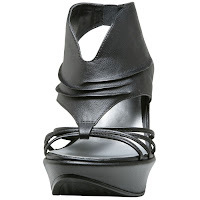 and stud the "hooded" part of the wedge (it's called the "hooded jasmine sandal".... oh payless...) . ANYWAY just a thought. opinions? hmmmm...they aren't TOO bad...try it!